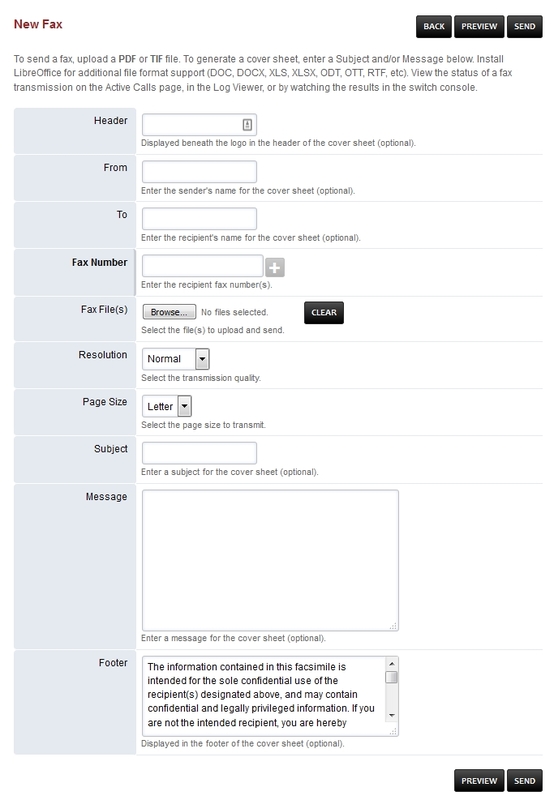 New: Create a new fax to send. Log: Sucessful and failed attempts for both incoming and outgoing. Active: Shows the faxes in queue. There are more settings for fax under Advanced > Default Settings then fax category. To create a fax server goto App > Fax Server. Click the + on the right. Leave the Destination Number blank or faxing wont work. Destination Number is used in the Fax Server Dial Plan and is set based on the fax server internal extension number. Define the fields, the ones in bold are required. It is a good idea to organize so define the name thoughtfully. The extension you must use one that is not allready created. Account Code should autofill. Again, leave the Destination Number blank. A prefix can be defined when sending a fax. Email is for inbound faxes and will be on the server and sent to the defines email. Define the Caller ID Name and Number. Leave the Forward Number and Greeting blank for normal settings. Number of channels define with a numerical value or keep blank for a default value. Keep organized by adding a Description. To send a fax, the items in bold are required. To send a proper fax it is best to fill out all fields and attach any documents. Keep in mind that the upload max MB is limited by Nginx and PHP config files. Click PDF to view the fax or right click on PDF and left click on Save Link As. 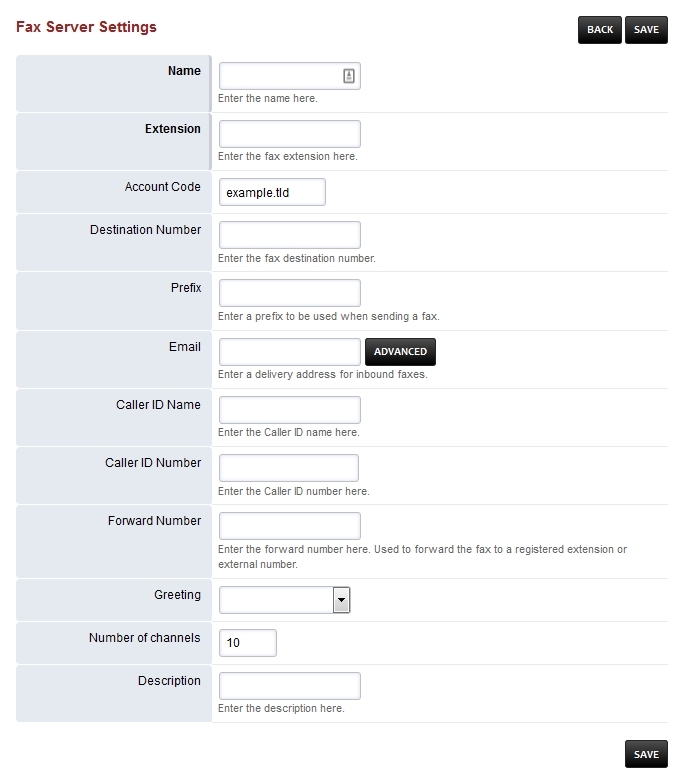 If you defined and email address in the email field you will receive the fax also to that email address. Click PDF to view the fax or right click on PDF and left click on Save Link As. To connect to a fax machine with an ATA you will most likely need to adjust settings in the ATA web interface and in FusionPBX. Create an extension for the FAX machine. You can optionally set bypass media to true under advanced in the extension settings. Some carriers it’s better for fax_enable_t38_request=true and for some its better for it to be false. It’s best not to make an assumption and to do testing with different settings to get the best results for your particular carrier. The variable fax_enable_t38_request=false will send a T38 reinvite when a fax tone is detected. In some cases the re-invite always fails for some carriers which is why it is default to false. From your FusionPBX installation go to ADVANCED > XML Editor and a new window will open. Choose autoload_configs folder from the list, then choose fax.conf.xml. In fax.conf.xml there is an option that by default sets a variable called verbose = false. If you change this to true you get more logging details as the fax is actually received, such as the quality of the connection etc. Here’s how you can get some totals.